For almost anyone who has spent time in Syston, Leicestershire, the name Toon is synonymous with "painter and decorator". (And cricket. Don't forget cricket!) An internet search will still find at least one Toon still involved in the painting trade... over 130 years! When I was a child, I'd often see Uncle Cecil or Uncle George cycle past, caps on their heads, A-shaped ladders somehow safely tucked under their arms, a bucket of paint on the handlebars... or later, more likely driving a van with the family business name on the side. The house on the Green in Syston had a paint store in the back yard--the old stable--and an office at the front, with all sorts of things that I wasn't allowed to touch. Wallpaper rolls. Grandad Fred Toon's collection of sign-writing inks. He wrote several of the signs in the parish church, all gold calligraphy on black. Grandad Fred wasn't born until 1882, way too young to have established the company in 1884. The story begins with his father, my great-grandfather, Willey or William Toon, and later with his mother, Annie Cook. Willey (that's what he was baptised, and how his birth was registered), was born on 24th August, 1860, in Syston, Leicestershire, the youngest son of Richard Toon (1801-1886) and his second wife, Mary Walker (1824-1881). Richard was 58 when Willey was born; his youngest daughter, Mary Matilda, was born two years later. I believe that between Mary nee Walker and his first wife, Catherine nee Cooper, Richard fathered fifteen children, but there may have been one or two more, or one fewer. There's a four-year gap in children between Emma (1851) and Arthur (1855), and given that there had been a child at least every two years during each of his marriages, the gap must tell a story. Also, Fanny Toon, born about 1860, is listed as Richard's granddaughter in the 1871 census, but I haven't yet discovered her parents--she might be his daughter? **Update: Fanny is likely the daughter of son Henry, born 1830, a drum major. 3 Brook Street, Syston, dated 1686. 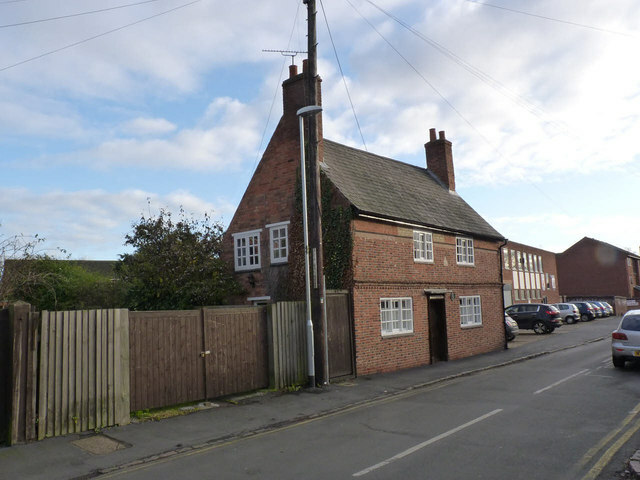 Richard and his family lived on Brook Street in Syston; Richard was a gardener. I don't know where he gardened, or if he was a flower gardener or a market gardener, but that's the profession that is listed on the censuses. Most of the houses from that time are gone now, and I don't know the exact location of house on Brook Street where Willey was born (the censuses do not give a house number), but I imagine it was a cottage like this one which still stands at number 3 Brook Street, a small home which housed Richard, his wife, and as many of the children as fit and who had not yet left home. The house would most likely have been thatched: slate roofs were added later. In 1861, the first time Willey appears on the census, there are five children at home; in 1871, five children of Richard and Mary's, plus Fanny Toon. By 1881, when Willey (now William) is 21 years old, there are only Richard, now a widower again and aged 80, William, daughter Ellen and granddaughter Kate (Catherine) Blankley, aged 22, daughter of Richard's daughter Charlotte (1836-1902) living in the house on Brook Street. In 1881, William Toon of Brook Street, Syston, is still single and is already working as a painter. That's the beginning of the story of the Toon painters and decorators of Syston, before William marries and raises his own family.